Amicable divorce and separation cases take approximately 4-5 months to resolve. If your case involves children or financial concerns, it can sometimes take longer. We recommend discussing your case at our no obligation initial consultation where we can advise you on timescales and costs. If your case becomes confrontational, Shortlands will work with a team of experts to ensure that it is fully prepared before presenting it in court. At this stage we will review timescales so that you are fully aware of the procedure and tasks involved. If you and your spouse have reached the difficult decision that you wish to end your relationship quickly, then the procedure for this is simple. 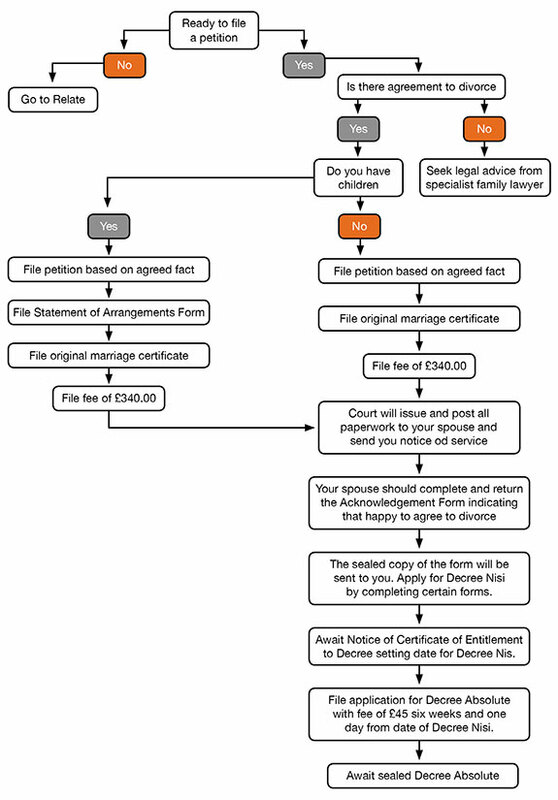 An ‘agreed’ petition can be filed with the court with your original Marriage Certificate and a fee. The other party will then be sent sealed copies of the petition, together with an Acknowledgement of Service form to complete indicating that they are happy for the divorce to proceed. There is no need for either party to attend court. The procedure is simple and essentially administrative. However, you may wish to seek advice from a lawyer to ensure all paperwork has been completed properly to avoid delay and complications in the future. For more extensive advice and information please email or call us to book a initial consultation.